Colour may look a little different from photos in different light. Uppers: textile & man made. Lining: textile & man made. Outsoles: man made. Size stamp is UK 6 D. Because of the velcro strap suitable for wider foot. These are a duck egg & green/blue 2 tone colours of leather. Lovely 1" wedge leather heel with rubber underneath. Size UK 4 EU 37 but snug fit so not for wider foot! Possibly also fit 3.5. Pic 6 of my size 4 foot but I have fairly slim feet. These are Clarks ladies sandals size 7. Excellent condition Clarks toe post sandals size 5 royal blue suede. Only worn once so no marks on the suede footbed. I'm having a clear out so please look at my other sandals. Thank you Posting by Royal Mail second class. CLARKS Cushion Soft Black Leather Sandals Size 8. Have been tried on but never worn. I hope that you can see the details from the photos. UK postage only please. clarks size 6 flip flops turquise. Condition is New with box. Dispatched with Royal Mail 2nd Class. Clarks black sandals size 5.5. Condition is Used.Please see photos Dispatched with Royal Mail 2nd Class. Size uk 5 D eur 38. Used but still in VERY Good Condition - see photo!!! Clark’s—Size 4–D fit—Surf Twist Tan leather Flip flop flat sandles—. Have been sat in Cupboard—Very Smart. Cream Leather. Size UK 3½. 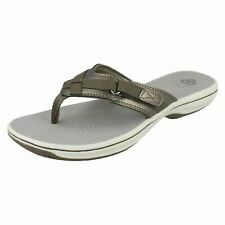 Ladies Hushpuppies size 7 flipflop sandals leather. Good condition leather upper and red check interior. Very comfortable toe post design lots of padding on sole. Condition is Used. Dispatched with Royal Mail 2nd Class. Clarks Wave Walk sandals toe post flip flops shoes silver gold suede size 5 D. Condition is Used. Dispatched with Royal Mail 2nd Class. Clarks Cushion Soft Ladies Toe Post Sandals 6.5. Condition is New with defects. There are some defects with these sandals, they have never been worn, stored at the bottom of my wardrobe for far too long. Please see photos for defects. Clarks Metallic Pewter Leather Slip On Wedge Mules/Sandals UK Size 7 VGC Dispatched with Royal Mail 2nd Class. Pretty Clarks Ladies White Leather Toe Post Flip Flops with silver and white flowal and lead details. Size 6. Good used condition as hardly worn. Clarks Pical Lipton Black Size 6 (39.5) BNWB. Lightweight EVA sole moulded to fit feet & ensure comfort. Condition is like new, clean inside and out. Perfect for beach. Size 8/41. New listingClarks Womens Black Toe Post Embellished Flip Flops Sandals UK Size 6D EU 39.5. Clarks Womens Black Toe Post Embellished Flip Flop Sandals UK Size 6D / EU 39.5. These come in lovely used condition. From a smoke free home. Thanks. Pretty Clarks Ladies Black Leather Toe Post Flip Flops with floral and leaf detailing. Size 6. Great condition as hardly worn. 'Soul of Africa'. FANTASTIC FOOTWEAR. In a great condition as worn just once. In a good used condition. Black leather 3d flower detail. FANTASTIC FOOTWEAR. In a great condition, very little wear to soles. Size UK 6 D.
Clarks have been making shoes for over two centuries, and in that time have produced a wide range of women's shoes. 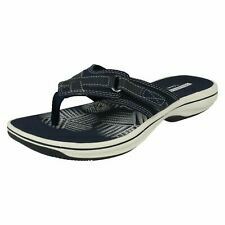 Counted among this range is their wide variety of flip flops suitable for both sport and leisure. 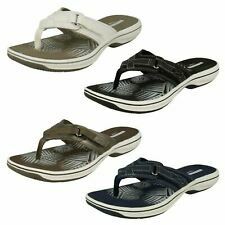 Generally, Clarks women's flip flops come in three different styles organised by height. Flat heeled flip flops are generally easier to put on and take off, and are the most traditional style of flip flop. They generally suit casual occasions or situations where shoes must be removed repeatedly. This includes areas such as saunas, spas, martial arts dojos or certain religious buildings. They are also great for on the beach as they are not only easy to take on or off, but it also easy to remove sand from them afterwards. Low heel flip flops are slightly more fashionable and enable you to accentuate several areas of your body, but can be slightly less comfortable than flat heels. They do not provide as much traction as flat heels, and therefore should only be chosen for steady surfaces. Great for leisurely beach goers, but they are not so great for rock pooling with the kids. Mid heel flip flops make the greatest fashion statement, but are not comfortable for walking in over longer distances. They should be chosen for casual social situations like barbecues or beach parties, rather than shopping or other activities involving long stints on your feet. Flip flops are the perfect footwear for many leisure activities but there are some things to bear in mind before purchasing them. They provide no ankle, arch or shock absorption support and so they are best avoided for long walks. Flip flops also have little to no grip and should only be used on even surfaces or sand, to prevent injuries from trips and falls.